Quiz Bird #3 Revealed/La Respuesta del Prueba! The winner of Bird Quiz #3 is TERESA BUENO of Atenas, CR, who is fast on her feet, quick with her fingers and good at telling a tale! Congratulations, Teresa! We will find a way to send your binocular cleaning cloth to Quepos, if we have to deliver it ourselves: hmmm, that’s a thought. 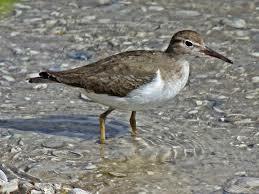 The answer is Spotted Sandpiper, Actitis macularia. We had a total of five correct answers, of which Teresa’s was the first received, and one wrong response. Mind you, this was an easy one. We could have tricked you with a photo of this species in non-breeding plumage like the one accompanying this post. La respuesta es Spotted Sandpiper, Actitus macularia. Tuvimos seis respuestas este vez, solo uno era incorrecto! Felicidades a TERESA BUENO de Alajuela de Atenas, Cosa Rica! Su respuesta estaba la primera recibido! Gracias a todos los participantes! This entry was posted in Special Event Reports, Special Events and tagged Bird Quiz #3, Birding San Vito Costa Rica, Spotted Sandpiper by AWOlivieri. Bookmark the permalink.